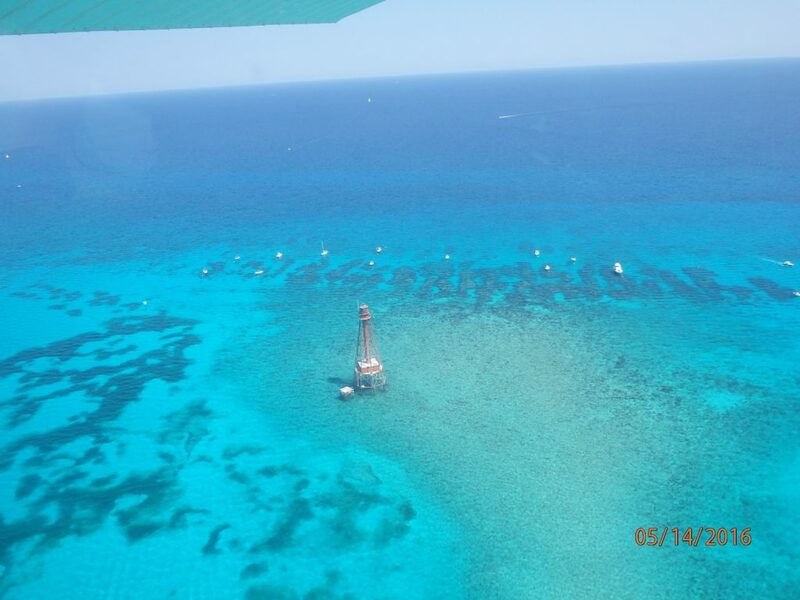 The Keys Fisheries Research program took to the skies in partnership with the Florida Keys National Marine Sanctuary (hereafter Sanctuary) management team to conduct an aerial survey of vessel use in the Sanctuary. Within the boundaries of the Sanctuary lie nationally significant marine resources, including hundreds of uninhabited Keys, the world’s third largest barrier reef, hard-bottom habitat, seagrass beds, mangrove trees, and more than 6,000 species of marine life. The Florida Keys are home for ~79,000 year-round residents and provide a destination for ~5 million visitors annually. Over the last few decades the number of registered vessels has increased, but the activities of these boaters and how their use of Sanctuary resources have changed over time is not well known. Understanding the patterns of boating activity in the Sanctuary is vital to evaluating the sustainable use of the valuable marine resources of the Sanctuary. 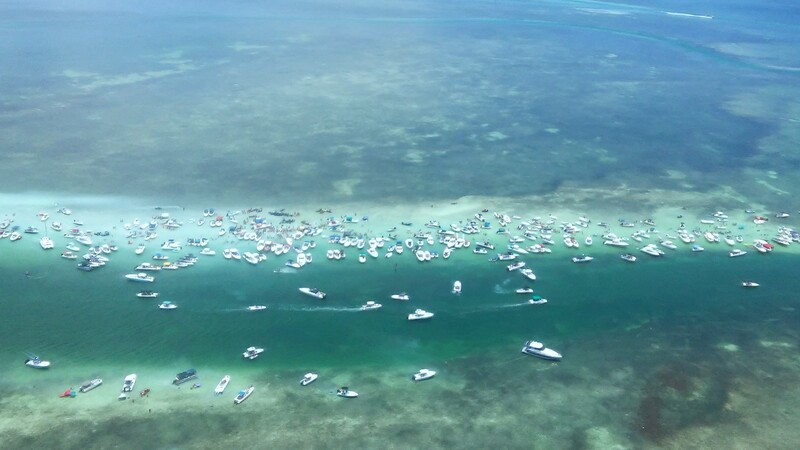 Whale Harbor Sandbar is the most popular sandbar in the Keys (331 boats were observed on the Sunday of Memorial Day Weekend 2016). FWRI scientists flew in small planes over the breathtaking waters of the Keys and recorded the type, location, and activity of every boat, personal water craft, kayak, paddleboard, etc. Over the course of 29 flights in 2016, we counted 52,107 boats. The number of boats peaked at nearly 5,000 during the opening days of lobster season and summer holidays. On average, 19% of boats were involved in fishing, 19% were involved in diving, 13% were anchored (with no visible activity), and 9% of boats were at sandbars. Many of the boats we observed (29%) were in transit at the time; however, these boats likely participated in other activities throughout the day. In addition to diving and fishing, other watersports (e.g., kayaking, paddle boarding, jet skiing) and partying at sandbars were popular among the Sanctuary’s visitors and reflect alternative ways in which people enjoy Florida Keys waters. Our research team conducted a similar aerial survey in 1992, and the comparison of vessel use data between 1992 and 2016 shows that there has been a major increase (~400%) in the popularity of watersports (e.g., kayaking, paddle boarding, jet skiing) and partying at sandbars. The 1992 aerial survey took place prior to the establishment of the Sanctuary Preservation Areas (Figure 1, SPAs). Establishment of the SPAs in 1997 limited consumptive activities within these areas and was intended to reduce conflicts between fishermen and divers. Because these areas were open to fishing during the 1992 aerial survey – including hook-and-line, recreational lobstering and commercial fishing, this allows us to examine how SPA implementation affected stakeholder activity. Currently, we are evaluating changes in dive and fishing boat spatial distributions after the SPAs were established. Sombrero Reef, a Sanctuary Preservation Area (SPA) off of Marathon hosts many divers and snorkelers throughout the year. 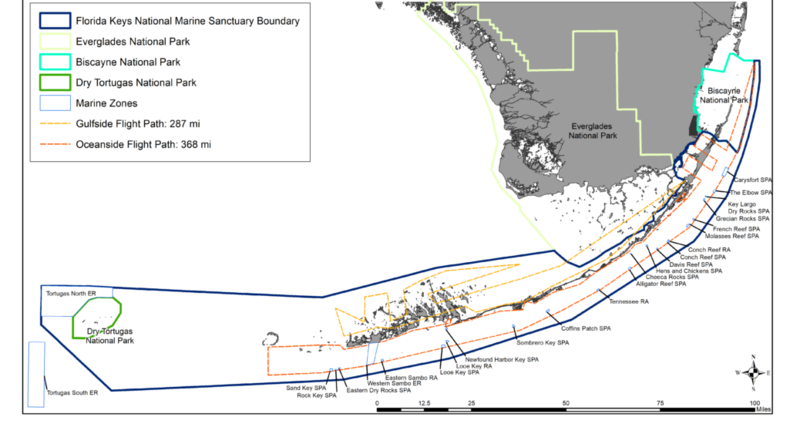 Besides providing an outstanding office view for our scientists, this project provided essential information to the Florida Keys National Marine Sanctuary managers regarding vessel use in the Sanctuary and how that use has changed over time, which should aid in future management decisions regarding Sanctuary resources. The U.S. Army Corps of Engineers (USACE) in cooperation with the Jacksonville Port Authority (JaxPort) have conducted a comprehensive economic, engineering and environmental study to examine the effects of increasing the depth of the existing Federally-maintained shipping channel in the lower St. Johns River (LSJR) from the current depth of 40-feet to a maximum depth of 47-feet between the mouth (Mayport, Florida) and river mile 13 (Figure 1). The channel deepening will allow access of larger vessels (Panamax and New Panamax classes) to deliver cargo to existing JaxPort terminals around Blount Island. The initial phase of dredging began in February 2018. Figure 1. 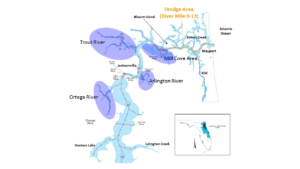 Map of lower St. Johns River (LSJR) highlighting the area being dredged (river mile 0-13; orange line) and the select tidal tributaries (Trout, Arlington, and Ortega rivers) and the Mill Cove area included in this project funded by the USACE (purple shading). River miles (small circles) represent 1-mile increments along the marked channel. Red lines indicate existing bridges. Base map with river miles and inset created by the SJRWMD and adapted by the FWC FIM program to highlight the current project. As part of the project evaluation, computer modeling scenarios were completed on the potential effects that the channel deepening might have on water quality, circulation patterns, salinity gradients, and a variety of ecological components (wetland vegetation, submerged aquatic vegetation, benthos, plankton, and nekton [macroinvertebrates and fish]) in the LSJR. Over 100 nekton species have been documented by the Fisheries-Independent Monitoring (FIM) program at the Florida Fish and Wildlife Conservation Commission’s (FWC) Fish and Wildlife Research Institute (FWRI) as using the estuarine portion of the LSJR and many of the species represent important commercial and recreational fisheries. During the evaluation, there were two specific areas the FIM program felt were in need of consideration with respect to nekton: 1) the potential effects of salinity changes on the spawning success, recruitment, and population dynamics of important recreational, commercial, and forage nekton and, 2) the potential effects of salinity changes on critical nekton habitat within the LSJR estuary. Within the estuary, channel deepening has the potential to affect salinity and water quality gradients, most likely by shifting distributions in these gradients within the estuary. These shifts may affect spawning and nursery habitats and ultimately influence the reproductive and recruitment success of estuarine-dependent nekton. Of particular concern are the tidal tributaries in the LSJR near and upriver from the area being dredged. 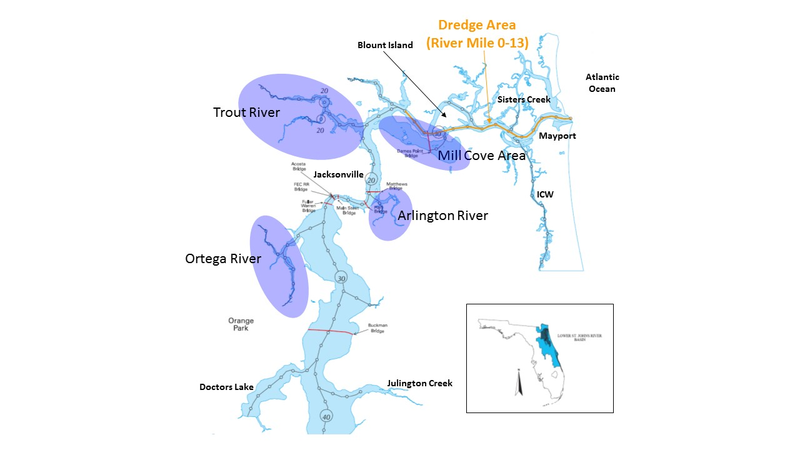 These tributaries between river miles 15 and 30 (Trout, Arlington, and Ortega rivers; Figure 1) and the estuarine section between Julington Creek (river mile 40) and Palatka (river mile 82; Figure 2) are highly influenced by freshwater inflow and generally have lower salinities than other portions of the LSJR estuary. The freshwater influence in these sections of the LSJR provides low salinity habitats that many estuarine and marine nekton require during their early life history stages. Previously collected data in these tributaries suggests that many recreationally and commercially important estuarine-dependent species (i.e. members of the Sciaenidae family [i.e. red drum, spotted seatrout, atlantic croaker, spot], white shrimp, blue crab, and mullet) utilize these habitats and that these areas likely represent critical habitats for maintaining healthy stocks of these species in the LSJR estuary and adjacent coastal waters. Also of concern with regards to potential changes in salinity would be impacts on resident freshwater species, especially within the Trout, Arlington, and Ortega rivers. Salinity increases could decrease the availability of freshwater habitat, thereby reducing the abundance of freshwater species in these tidal tributaries. The Mill Cove area, although freshwater inflow is limited, is also of concern because the salinity modeling done by the Corps identified it as the area most likely to experience the greatest salinity changes. Young-of-the-year (YOY) and juveniles from numerous nekton species utilize this habitat during ingress, egress, and as nursery habitats. Figure 2. 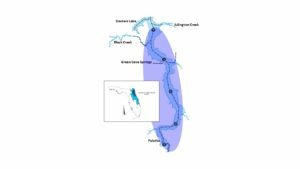 Map of lower St. Johns River (LSJR) highlighting the long-term sampling area between Julington Creek (river mile 40) and Palatka (river mile 82; purple shading) previously funded by the SJRWMD and now funded by this USACE project. River miles (small circles) represent 1-mile increments along the marked channel. Red lines indicate existing bridges. Base map with river miles and inset created by the SJRWMD and adapted by the FWC FIM program to highlight the current project. Since 2001, the Fisheries-Independent Monitoring (FIM) program has monitored nekton abundance and distribution in the LSJR estuary downstream of Julington Creek (river mile 40; Figure 1). 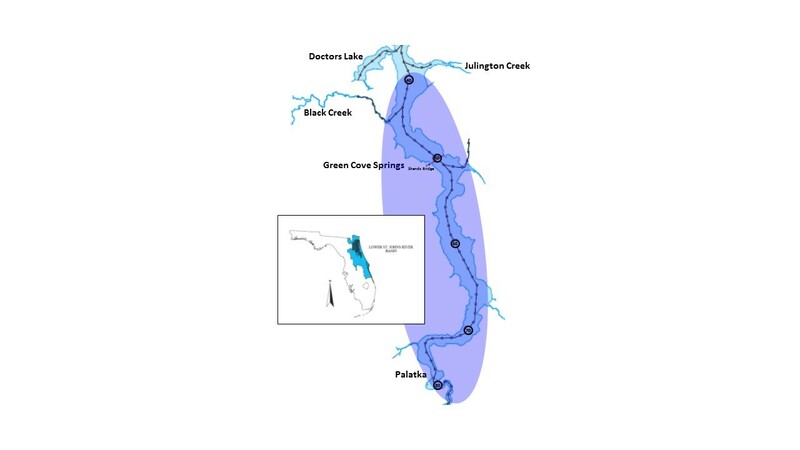 Between 2005 and 2016, funding from the St. Johns River Water Management District (SJRWMD) enabled the FIM program to extend sampling upriver from Julington Creek (river mile 40) to Palatka (river mile 82; Figure 2). The FIM program uses a multi-gear approach in a stratified-random sampling design to collect data on nekton from a wide range of habitats and life history stages. Water chemistry, habitat, and physical parameters are recorded at each sampling site. The FIM program sampling was designed to monitor fishery resources in the estuary as a whole and, therefore, does not include individual tributaries as specific sampling strata, but instead includes them as portions of larger geographic strata. The spatial extent of the tributaries is very small compared to that of the entire estuary, so the individual tributaries are often underrepresented and inconsistently sampled in the current sampling design. Data from the existing FIM program design, therefore, are not sufficient to assess changes in nekton composition and abundance due to perturbations, such as a channel deepening, within specific areas (tidal tributaries and coves). Estimating impacts to the nekton assemblage from the channel deepening in these areas requires a sampling strategy that focuses on these specific areas of the LSJR estuary. To gain a better understanding of the relationships between channel deepening, salinity, water quality, water flow, estuarine habitats, and the abundance of estuarine-dependent and freshwater-resident species that inhabit the identified areas of the LSJR, the FIM program and the USACE have developed a long-term monitoring project to determine the impact of the dredging activities on the spatial distribution and abundance of nekton within the LSJR. The long-term monthly sampling, which began in May 2017, and has the potential to run through 2035 (funding dependent), will increase the resolution of nekton data within the identified tidal tributaries (Trout, Arlington, and Ortega rivers) and the Mill Cove area (Figure 1) as well as continue the long-term sampling upstream of Julington Creek (Figure 2), for which funding from the SJRWMD was withdrawn at the end of 2016. This project will allow for the assessment of the effects of channel deepening on nekton assemblages in these critical LSJR estuarine habitats. The acoustic telemetry research activities in the Finfish Biology subsection of Marine Fisheries Research continue to deliver . . . in surprising fashion. Answering concerns expressed by Florida panhandle anglers about the status of cobia in the Gulf of Mexico, a pilot project was conducted in Pensacola, Florida seeking to connect cobia (Rachycentron canadum) research between Gulf and Atlantic waters. And connect it did! Typically, cobia, a coastal migratory species, are abundant along panhandle beaches during spring. The popular paradigm is that cobia migrate from warm wintering grounds in south Florida towards the productive Mississippi delta. Northern gulf anglers have noted decreases in catches during recent years and tournament records appear to support these anecdotal observations. Partly in response to these concerns, the FWC reduced daily bag limits of cobia in state waters of the Gulf of Mexico. Researchers formed relationships with knowledgeable captains to facilitate this pilot project, creating important relationships upon which future research by FWC and other institutions will be based. Thanks to their eager cooperation, six cobia were tagged with acoustic transmitters off Pensacola and two acoustic receivers were deployed in April 2017. Tequesta biologist Jim Whittington surgically implants an acoustic tag into a cobia. The receivers were retrieved by Finfish Biology divers in late May 2018. Logic and experience suggest such a low saturation of transmitters and receivers would have a low probability of yielding meaningful results. But, half of the six cobia were detected on the Pensacola receivers within miles of where they were originally tagged. Another tagged cobia was harvested farther east at Destin, Florida on November 2, 2017. 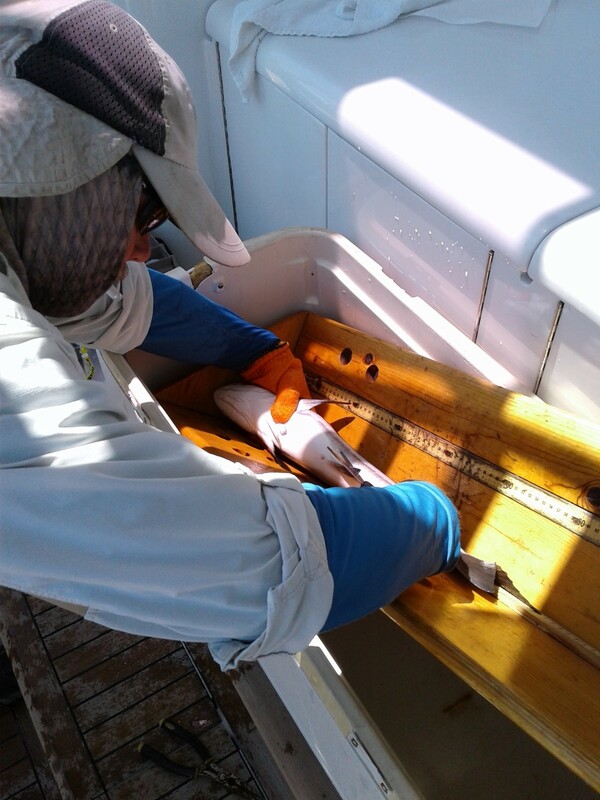 Surprisingly, one Pensacola tagged fish was detected on receivers deployed off Cape Canaveral along the Atlantic coast of east-central Florida! But it gets even better. The two Pensacola receivers that were deployed detected two cobia that were originally tagged off Cape Canaveral during Aug. 3-4, 2016. One of these was detected on receivers in the Florida Keys, then was detected later at two stations off Pensacola in June and July, 2017. It then returned to the Ft. Pierce area in southeast Florida where it was harvested on December 3, 2017. The other cobia that was tagged at Cape Canaveral was detected on receivers in the Keys, and was last detected off Pensacola on May 1, 2018. The results of this pilot project with its scant resources have been significantly more fruitful than expected. The boundaries of the Gulf of Mexico cobia stock include southeast Florida based on genetic analysis. What appear to be fairly regular movements of cobia between at least Pensacola and Cape Canaveral supports this stock delineation and provides information on the northern extent of the stock boundary in southeast Florida, which has been uncertain. Expanded research should continue to close knowledge gaps about this important gamefish. Major portions of the coastal embayments in northeastern Florida Bay have been closed to public access, and thus to recreational fishing, since the creation of the Crocodile Sanctuary in 1980. The 2015 Everglades National Park (ENP) General Management Plan called for the opening of Joe Bay, which is part of the Crocodile Sanctuary, to public, non-motorized access and catch-and-release fishing. The Fish and Wildlife’s Research Institute’s Fisheries Biology and Fisheries-Independent Monitoring (FIM) programs are involved in a cooperative study with Florida International University, the Snook and Gamefish Foundation, the Audubon Society, and the National Park Service to examine the effects of the 36-year closure and subsequent opening of Joe Bay to catch-and-release fishing. Locations of Little Madeira Bay, Joe Bay and Long Sound in Florida Bay. To examine the effects of the closure on fish and macroinvertebrate (nekton) community metrics and recreationally important fish species, fisheries-independent and -dependent sampling methods are being employed across three embayments from 2016-2019 (Figure 1). Two of the embayments are in the Crocodile Sanctuary; Little Madeira Bay has been and will remain closed to fishing while Joe Bay was opened to fishing in November 2016. A third embayment, Long Sound, is not in the sanctuary and has been open to fishing the entire time. Although the three coastal embayments appear similar in size and function, there are substantial environmental differences among the basins. Freshwater inflow into Joe Bay is much greater than the other two basins, and sediment depth and the amount of submerged aquatic vegetation (SAV) are quite low. Long Sound also has a very thin sediment layer but typically had the highest salinity, and in recent years, has experienced an increase in SAV cover. Little Madeira Bay has both a thick sediment layer and a consistently high percentage of SAV cover that includes Thalassia, indicative of a climax seagrass community. 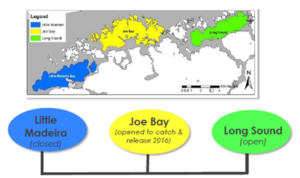 These existing spatial and habitat relationships will affect the prey base and recreational fishes and will be considered in assessing the effectiveness of the new management strategy. Fisheries-independent surveys are being conducted during wet and dry seasons by FWC using small (21.3-m) and large (183-m) seines and by FIU using baited remote underwater video systems (BRUVs) using GoPro technology (Figure 2). In the first year of seine sampling, nekton communities differed significantly among basins; relative abundance of nekton was greatest in Little Madeira Bay, and the most numerous species were small-bodied fish that serve as the prey base, such as killifishes, mojarras, gobies, and schooling fish (silversides and anchovies), collected by the small seine. Unfortunately, the large seine technique (which collected the majority of recreationally important species) was only used in Long Sound and Little Madeira Bay because the depths and substrate in Joe Bay are not suitable to this sampling gear. The BRUVs, however, were deployed in all basins, and in contrast to the seine sampling, indicated that community composition was similar across basins. Recreationally important species were most frequently observed in Little Madeira Bay in seines, but in Joe Bay on BRUVs. 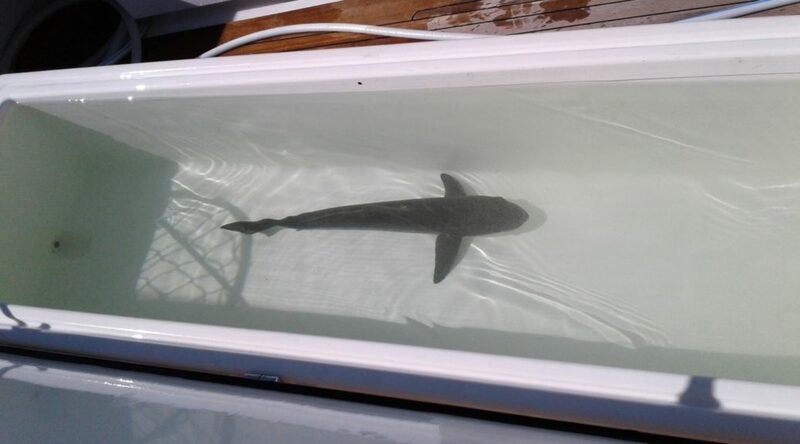 Sharks were seen frequently on video in Little Madeira Bay and may be affecting BRUV observations there. Trophic groups (small prey, large prey, mesoconsumers, and top predators) appeared stable over time as compared to previously collected seine data using the same methodology from 2006-2009, but there was preliminary evidence of species-specific differences within basins and over time. Three methods are used to determine the effects of the fishing closure: A. BRUVs, B. Seines, C. Angler Reporting System. Fisheries-dependent information is being obtained through an angler reporting system developed in conjunction with FIU, the Snook and Gamefish Association, and the Audubon Society (Figure 2, paper surveys and a mobile application). So far, the angler reporting system has a good response rate, but visitation to the recently opened no-motor zone in Joe Bay was low. Two more years of sampling are ahead for this project, so more comprehensive data analyses incorporating hydrological and habitat dependencies are planned. Seine and BRUV nekton community data will be compared between gears and across estuaries, and the long-term trends in visitation and angler experiences documented by the angler reporting system will be examined. This project will provide useful data for developing a long-term protocol for fisheries monitoring in these embayments into the future and demonstrates the advantage of collaborative research to reach a common goal. Bay scallops (Argopecten irradians) may have a short life, typically living for about a year, but they play a big role in the economies of many coastal Floridian towns, like Steinhatchee and Port St. Joe. In 2016, the scallop team within the molluscan fisheries group began a 10-year project to restore bay scallops to self-sustaining levels in Florida’s Panhandle. The project is funded by restoration money set aside after the Deepwater Horizon oil spill and is intended to increase recreational fishing opportunities in the Florida Panhandle. The goal of the project is to increase depleted scallop populations and reintroduce scallops in suitable areas from which scallops have disappeared. Restoration efforts are focused on coastal estuaries within the Florida Panhandle that have been divided into five regions, as shown on the map. Bay scallop populations in the Florida Panhandle are currently classified as ‘collapsed’ with population densities below 0.01 scallops per m2. In St. Joseph Bay, this collapse may be due in part to a red tide event that occurred from winter 2015-spring 2016. The red tide resulted in a lack of recruitment in 2016, leading to a sharp population decline. Scallop restoration efforts were primarily focused on St. Joseph Bay in 2016-2017. This year, restoration efforts will expand to St. Andrew Bay and St. George (regions 3 and 5). The scallop team is planning to use a three-step approach to enhance bay scallop populations within targeted restoration areas in the Florida Panhandle by: (1) installing cages holding groups of adult bay scallops, (2) releasing hatchery-reared or naturally-harvested juvenile bay scallops (spat) at restoration sites, and (3) releasing hatchery-reared bay scallop larvae. Each year, the scallop team collects adult scallops from St. Joseph Bay and brings them to a hatchery which provides juvenile scallops the following year. These hatchery scallops are then placed in cages in a no-entry zone in St. Joseph Bay. Placing scallops in cages protects them from predators and increases the likelihood that scallops will successfully produce offspring during the spawning season. Beginning in 2017, scallop collectors were placed in St. Joseph Bay and St. Andrew Bay to collect wild scallop spat. The spat are raised at the Florida State University Coastal and Marine Laboratory and once they reach a size of 30mm they will be planted in cages in their respective bays. Last year we placed 2,500 wild and hatchery-produced scallops in cages in St. Joseph Bay. In addition to traditional approaches to restoration, our vision for restoring scallops also includes educating the public about our ongoing restoration projects and asking them to be contributing partners in these efforts. To that end, we have recruited 200 volunteers to help restore scallops in St. Joseph Bay and St. Andrew Bay. In April, we will provide scallops and predator exclusion cages to these volunteers at workshops held in Panama City and Port St. Joe which will be hosted by our partners at Sea Grant. Our volunteers, or ‘Scallop Sitters’, will place their cages with scallops off privately-owned docks, or, if they have a boat, they will place these cages in the bay. We will give a webinar to discuss this project and provide training for our ‘Scallop Sitters’ through the FWC webinar series on April 16. 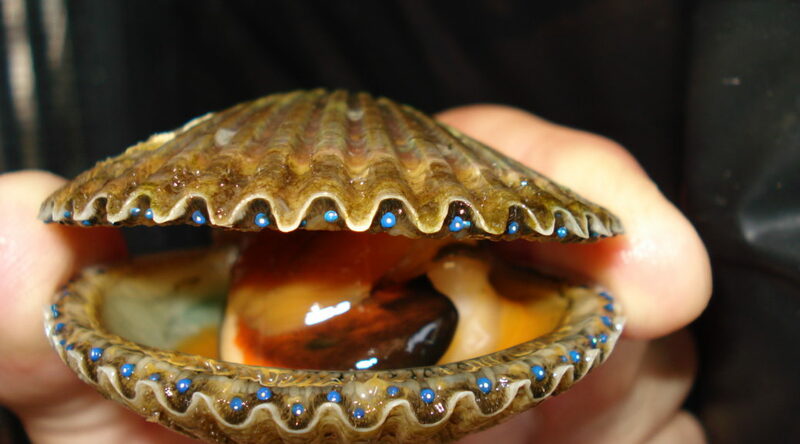 Volunteers that are unable to attend our workshops in April will be able to view this webinar and participate in our scallop restoration program. We hope that by partnering with the community we will increase our chances of successful restoring scallops to stable levels (>0.1 scallops/m2) in St. Joseph Bay and St. Andrew Bay. If you have questions about the program or want to get involved, please email us at bayscallops@myfwc.com. A portion of the Deepwater Horizon’s Natural Resource Damage Assessment (NRDA) settlement was earmarked for the construction and operation of a production-level fish hatchery in the Florida Panhandle. A partnership between FWC, DEP, and the City of Pensacola has designed a hatchery facility (Gulf Coast Marine Fisheries Hatchery and Enhancement Center) to be built in Pensacola, Florida. The release of hatchery-reared animals is ethical only when both the wild and hatchery-reared stocks are monitored to ensure that wild populations are not adversely impacted. Accordingly, the Fisheries-Independent Monitoring Program (FIM), with its long history of working with the Stock Enhancement Research Facility in Manatee County, was tasked with developing a sampling program for estuaries in the Florida Panhandle. 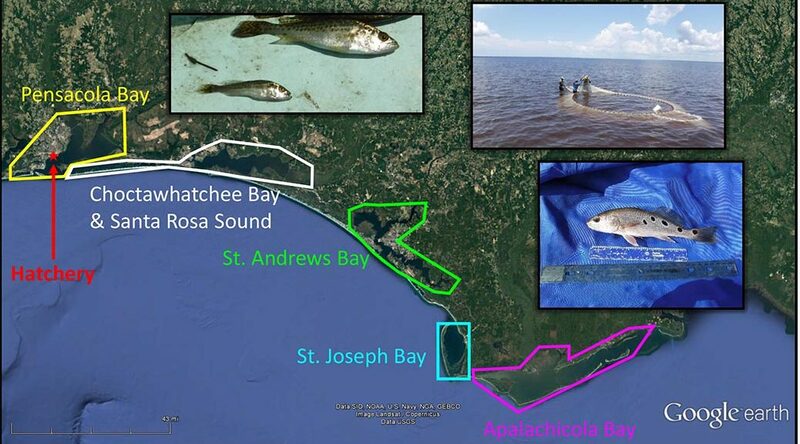 With the potential release of in-season Phase I (1.25 inches) Red Drum (Sciaenops ocellatus) and Spotted Seatrout (Cynoscion nebulosus) into five Panhandle estuaries (Pensacola Bay, Santa Rosa Sound, Choctawhatchee Bay, St. Andrews Bay, and St. Josephs Bay), it was determined that the most appropriate sampling approach would be the use of 21.3-m seines in shallow water habitats. Historical data collected by the FIM program from Apalachicola Bay (1998-2015), and Choctawhatchee Bay/Santa Rosa Sound (1992-1997) were used to develop a sampling design that would use 21.3-m seines to assess wild populations prior to hatchery releases, and wild and hatchery-reared populations after releases are initiated. Sampling of wild stocks began in July 2017 in all five estuaries and will occur monthly from July through December each sampling year. The timing of this sampling coincides with peak young-of-year recruitment for both Spotted Seatrout (July – September) and Red Drum (October – December) into estuarine nursery habitats in Florida Panhandle estuaries. 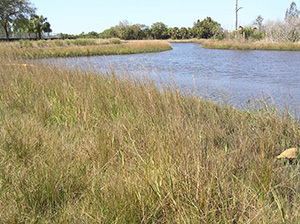 Aside from a shorter sampling season, this survey employs identical protocols that are currently used in several other estuaries throughout Florida; therefore, project-associated data will be comparable to 21.3-m seine data collected throughout the state, so data should quickly be useful in stock assessments. Young-of-the-year estuarine-dependent fish, such as Red Drum and Spotted Seatrout, depend on suitable nursery habitat to provide critical foraging grounds, refuge from predators, and essential abiotic conditions necessary to optimize growth and survival to adulthood. The data collected from this survey will allow FWC to identify these essential habitats in Florida Panhandle estuaries, allowing for the release of hatchery-reared fishes where they will have the greatest chance for survival. Current sampling efforts are also identifying trends in recruitment variability for wild stocks. Sampling after releases begin will gauge the relative contribution of the hatchery to overall stocks and assess the efficacy of these stocking efforts. Data from year one of this study will be summarized with a preliminary presentation occurring at the FWRI-FIM program’s annual meeting in St. Petersburg, January 24 – 26, 2018. The Southeast Data, Assessment, and Review (SEDAR) is the cooperative process by which stock assessments of federally-managed species are conducted in the Southeast Region of NOAA Fisheries. SEDAR was initiated to improve planning and coordination of stock assessment activities and to improve the quality and reliability of stock assessments. SEDAR strives to provide an open and transparent approach for development and review of the scientific information on fish stocks that is critical to effective management and decision making, and includes participants from various sectors, including researchers, stock assessment scientists, managers, and stakeholders. Many research groups at the institute provide data critical to the SEDAR process, including data on landings and discards from the commercial and recreational fishery, discard mortality, and life history including age and growth, reproduction, and stock identification. Data provided by the FIM program typically include trends in relative abundance through identification. Data provided by the FIM program typically include trends in relative abundance through time as well as annual estimates of size/age composition. Because these data are meant to characterize fluctuations in managed fish populations through time, several years of data are often required before fishery-independent indices become useful. Nevertheless, FIM data are increasingly being used for the assessment of managed fishes, including the ongoing SEDAR 51: Gulf of Mexico Gray Snapper. 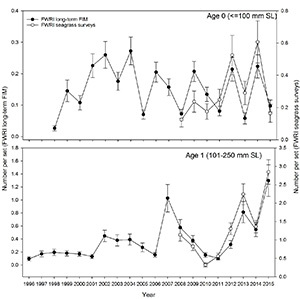 Data from long-term seine-surveys (initiated in 1996 – 1998, depending on estuary) and recently-implemented polyhaline seagrass seine and trawl surveys (initiated in 2008) were analyzed separately to generate indices of abundance for age-0 (≤ 100 mm SL) and age-1 (101 – 250 mm SL) Gray Snapper; a single index was developed for each by combining data from multiple estuarine systems. In general, indices for each age class were similar between surveys (Figure 1); index results documented strong interannual variability in age-0 recruitment, but a generally increasing trend in the relative abundance of age-1 Gray Snapper. 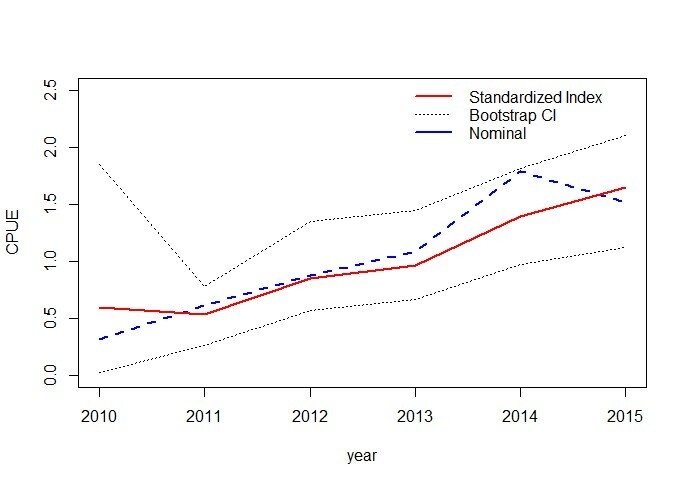 Although the SEDAR Data Workshop recommended incorporation of the long-term index only to avoid duplication, future efforts to incorporate data fromboth surveys into unified age-0 and age-1 indices should dramatically increase the statistical power of these indices. Figure 2. Relative standardized index (solid red line) with 2.5% and 97.5% confidence intervals (black dotted lines) and the nominal index (blue hashed line) for Gray Snapper in the FWRI West Florida Shelf Video Survey. In addition, data from the FWRI video survey off Tampa Bay and Charlotte Harbor were analyzed to generate and index of abundance for subadult/adult Gray Snapper (generally ≥ 300 mm FL) from 2010 – 2015. Model results generally corroborate the increasing trend in abundance of Gray Snapper in recent years. Although useful, this model was ultimately not recommended for incorporation, as an additional model, it was developed utilizing data from FWRI, NMFS – Panama City, and NMFS – Pascagoula video surveys. This September marked twenty years since the first harvest of Spartina alterniflora from the constructed treatment marsh at the Stock Enhancement Research Facility (SERF). This initial harvest was used for coastal restoration near City Island in Sarasota Bay. The 1.9-acre effluent marsh was constructed and planted with 20,000 Spartina sprigs from a local wetland nursery. The marsh is connected to a two-acre settling pond that works together to filter nutrients and solids from hatchery discharge. 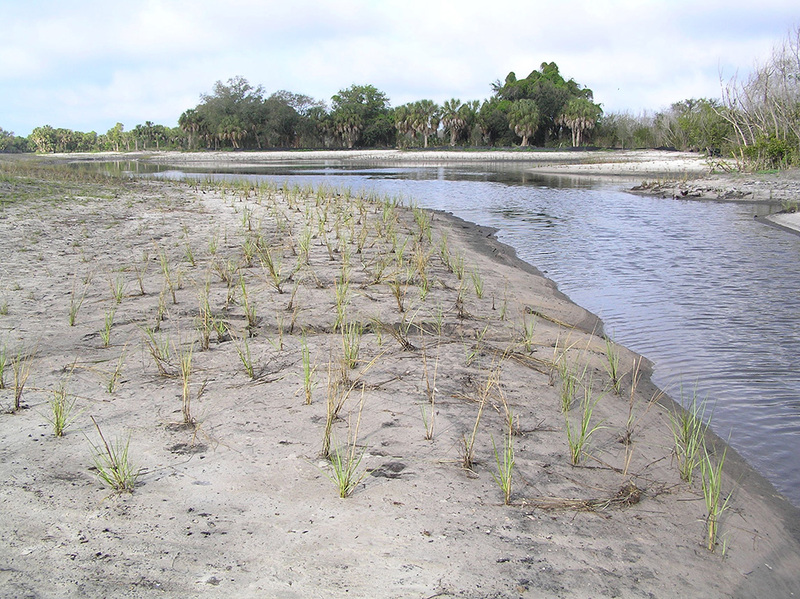 9,300 Spartina plugs harvested from the SERF marsh were planted at Clam Bayou in Pinellas County, March 11, 2011. Photo by Brandt H.
Spartina are harvested from the SERF marsh by an army of volunteers coordinated by FWC and like-minded partners for coastal habitat restoration. Plants are dug from the marsh and separated into plugs of two or more culms (stems), then counted and packaged into plastic bags for transport to restoration sites. Shoots, or single stem Spartina, are separated at harvest for school nurseries. Five thousand Spartina plugs are planted to restore one-acre of coastal marsh. Since 1997, almost 1.2 million plugs were harvested by partners and given to 67 restoration sites. These plants often grow rapidly at these restoration sites (photo below). 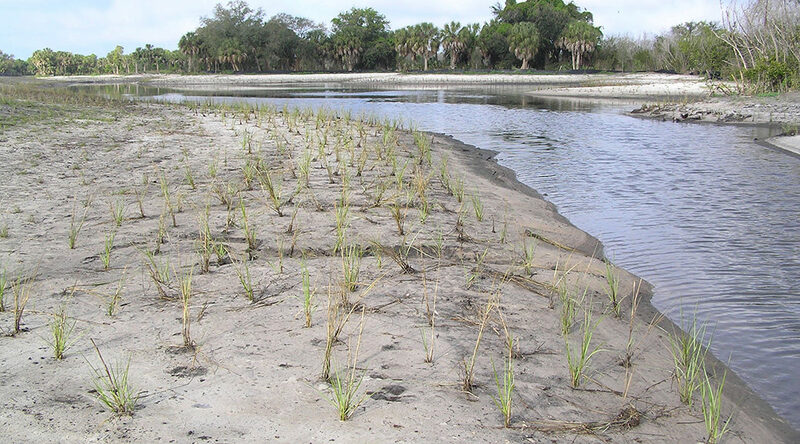 Approximately 411,282 Spartina shoots were harvested from the FWC donor marsh and provided to establish 35 school nurseries for education and environmental awareness. Revitalized Clam Bayou marsh in Pinellas County March 15, 2012 (Photo provided by Brandt Henningsen with the Tampa Southwest Water Management District). Recently, the variety of marsh vegetation used for restoration has expanded to include Paspalum vaginatum, a saltmarsh grass. In a short period of time over 28,000 plugs of Paspalum have been donated for coastal uplands restoration. This demonstrates that effluent donor marshes for fish hatcheries are an effective approach for hatchery wastewater treatment while supplying valuable native plants for coastal habitat restoration.